Pests listed here are those which are most commonly observed in New York State, and any timing recommendations given may be applicable to NYS only, hovever, many of the pests listed may also be common to other states in the Northeast or throughout the United States. As chemical control recommendations are constantly changing, no specific chemical controls will be listed here. Please refer to the current Pest Management Guide for Commercial Production and Maintenance of Trees and Shrubs, or contact your local Cooperative Extension Office for pesticide recommendations. Choose from among the following list of topics in our 'Pest Menu' below. FACTSHEET PHOTOS: Many of the photos were taken by our department photographer Kent Loeffler. See the Plant Pathology Photo Lab web site for more details. Additional information concerning Pine Shoot Beetles, European Gypsy Moths, Asian Gypsy Moths, or other exotic pests, can be obtained from the NAPIS (National Agricultural Pest Information System) Pest Tracker and CAPS (Cooperative Agricultural Pest Survey) web sites. 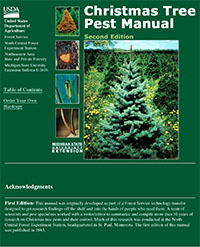 USDA Christmas Tree Pest Manual, Second Edition.